It would be easy enough to dig up an ancient Fall video to welcome the arrival of the official first day of Autumn but alas I will not. 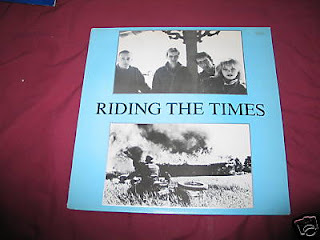 Thirst released one EP on Ebony Music / Rough Trade in 1987 called Riding the Times. The band featured Martin Bramah (of the Blue Orchids who also featured a Fall member Una) and Karl Burns, both ex patriots of the band the Fall. Thirst does not mirror the Fall musically to a large degree - in fact they sound like many of the late 80s commercial brooding mid tempo UK pop bands with a touch of the 70s Modern Lovers thrown in. I don't love this record but I am fond of the title track which you can listen to here. For you Fall collectors this record isn't a super easy find but when you do - it should be affordable- somewhere between $5 and $10.